Gojko Kasich doesn't expect Bob Knight to return as Indiana's basketball coach, but he does expect his alma mater to follow the law. Kasich claims university president Myles Brand deliberately circumvented a state law by meeting separately with two groups of four school trustees before deciding to dismiss the Hall of Fame basketball coach. Kasich believes that Brand was obviously attempting to dance around Indiana's Open Door Law, which requires that Brand make public any meeting with more than four trustees at a time. "This was a backstabbing, behind the back, back-door meeting," Kasich said. "If the court finds in our favor, all decisions made and stemming from this illegal session will be declared void." Kasich plans to file a lawsuit next week. Kasich said he is not acting on behalf of Knight. "Because the last thing in the world we want to do is file a lawsuit that would affect Bob Knight deterimentally, I did call (Knight's attorney) Russell Yates," said Kasich, who represents about 45 clients in the lawsuit. 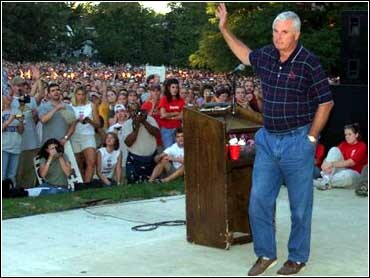 "I asked if this would affect Bob Knight in the wrong way, and he said 'No.' That's all I asked him. "It's not like any one of the plaintiffs is out to put Knight back on the bench because it's water under the bridge, and I don't think he'd return anyway." Brand claims he did nothing illegal. In an e-mail to some of the potential plaintiffs in Kasich's lawsuit, Brand concluded, "In my opinion, and that of our attorney, our actions did not violate the state's open meetings act." Brand fired Knight on Sept. 10, saying the coach violated a "zero-tolerance" behavior policy that had been in place since May. Indiana spokesman Christopher Simpson said Thursday that Brand met individually with some trustees at a football game the day of the firing, and that he met with others in small groups, but he intentionally never had a quorum. "He wanted to get some feedback," Simpson said. He added that even if the trustees had officially met, the meeting could have been closed since it involved a personnel matter. However, prior public notice of executive sessions is required by law. Kasich said he was contacted by numerous people after a story ran in a campus newspaper about the trustees meeting with Brand, and he now has 45 plaintiffs for the lawsuit. "The president told us he didn't want a quorum of trustees," the Indiana Daily Student quoted trustee Cora Breckenridge as saying. "He was having a meeting with four trustees at 10 o'clock and a meeting with four trustees after that. The ninth was out of the country." Breckenridge also said that no vote was taken at the sessions. Indiana Public Access Counselor Anne Mullin O'Connor, who is resonsible for addressing complaints of meeting law violations, said the lawsuit is not without merit. "I don't disagree with (Kasich's) contention that this was purposely done to avoid the law," O'Connor said. "It violates the spirit of the law. I completely agree." But O'Connor warned that her opinion is only advisory and does not carry the legal weight of a judicial finding.